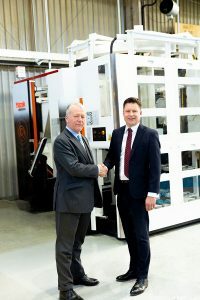 To support continued expansion, Middlesex Aerospace has committed to a seven-figure investment with long-term machine tool partner Yamazaki Mazak. The Basingstoke-based, 150-employee company is one Britain’s leading tier-one suppliers of critical components and assemblies to major OEMs throughout the global aerospace market. Two state-of-the-art, five-axis multi-tasking machines, and one horizontal machining centre complete with an expanded tool storage system, comprise the latest investment.